Rico Tice is an associate minister of All Soul’s Langham Place, London, UK, and founder of Christianity Explored Ministries. His latest book is Honest Evangelism: How to Talk about Jesus even when it’s Tough, (which includes a foreword by D. A. Carson). what promises to be a great night of teaching and fellowship. Rico is also an old Friend of Edenderry CE, and we are delighted to be able to welcome him for a special CE on Wednesday the 21st March @ 8 pm in the main hall off Watson Street. 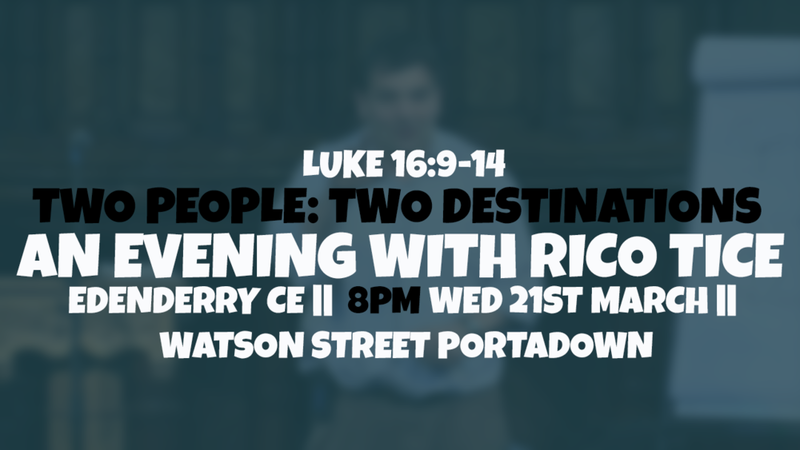 Rico will be speaking from Luke 16:9-14; "Two Men: Two Destinations." While this is a continuation of CE's series in Luke, we want to encourage everyone to come along, especially if you intend to run a Christianity Explored Course.